I have this constant problem. We are always buying food... but we are always out of food around this house! 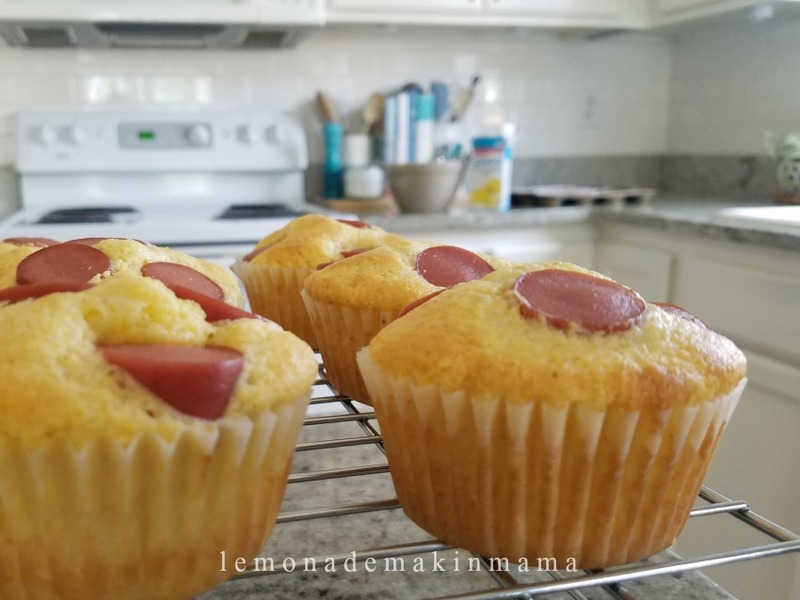 The corn dog muffins couldn't have been easier and worked out to be a mere nineteen cents each, and were my son's very favorite. He put a little dollop of ketchup on top and said they were amazing. He always loved corn dogs as a little boy. For these, I purchased two of the seventy five cent jiffy corn muffin mixes (you add one egg and a little milk) and one package of hot dogs for $2. 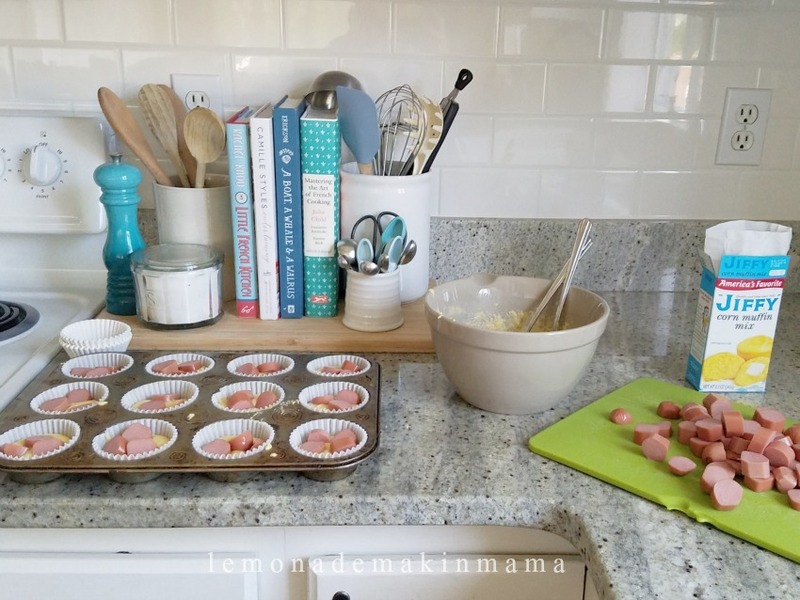 I mixed the muffins according to the package, and topped each with three or four pieces of cut up (uncooked) hot dogs. I baked the muffins according to the package and froze half the batch for later. As for the chunky monkey bites... They were a fluke but seriously awesome, according to one hungry child, so we will be making these again for sure. (I had purchased a ton of bananas a couple of weeks ago, that were on their way out, so I peeled, cut and froze the chunks thinking we could just make smoothies unless we came up with a better idea.) Each chunk was about 1/3 of a banana. 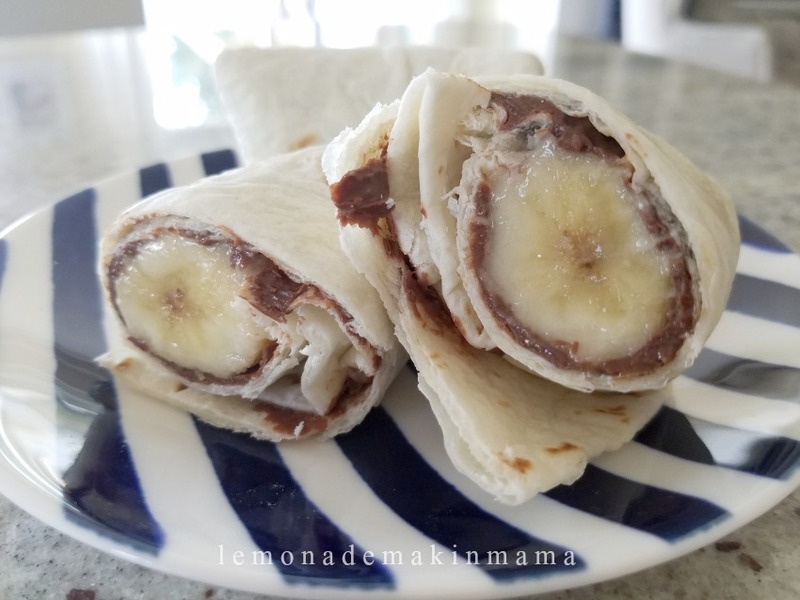 I also had some flour quesadilla shells just sitting in my fridge, so I bought a can of Nutella at the store and assembled these much the same as the bean and cheese burritos. These are a great way for me to get some potassium into my runner in the summer heat. Finally, the snack my daughter loved - Pizza rolls. I made these because we had evening plans, Ava had a guest, and I didn't want them eating cereal. 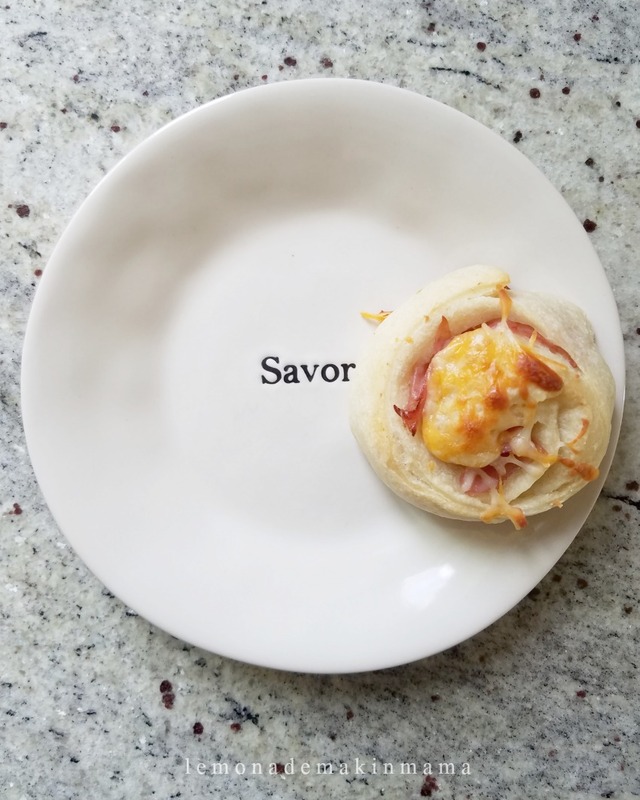 A store-bought pizza crust for two dollars, which I unrolled, spread some deli ham slices down the center, and topped with leftover shredded cheese from the burritos. I rolled it all up in a long roll, sliced it and placed each one (cinnamon roll-style) into a greased baking dish and baked according to the crust instructions. I don't think the cost breakdown on this was much since I got the deli ham on sale for $2. Probably about thirty cents a roll. When it comes to feeding teenagers food that fills them up when you're on a budget, I'm still learning. But one thing that I have learned for sure about them. They will eat whatever you put out. And they will eat it all until it's gone. If I don't want an entire dish of something eaten, I put half into the fridge for later... and when I need to make our bulk shops stretch between paydays, I divide the contents and freeze or store portions out of the pantry, and out of sight. Special occasion food often gets put into brown bags and labelled for a shelf in the garage until we need it for the occasion. Trust me, this is the only way to make food last if you want to shop once a week! Ha! 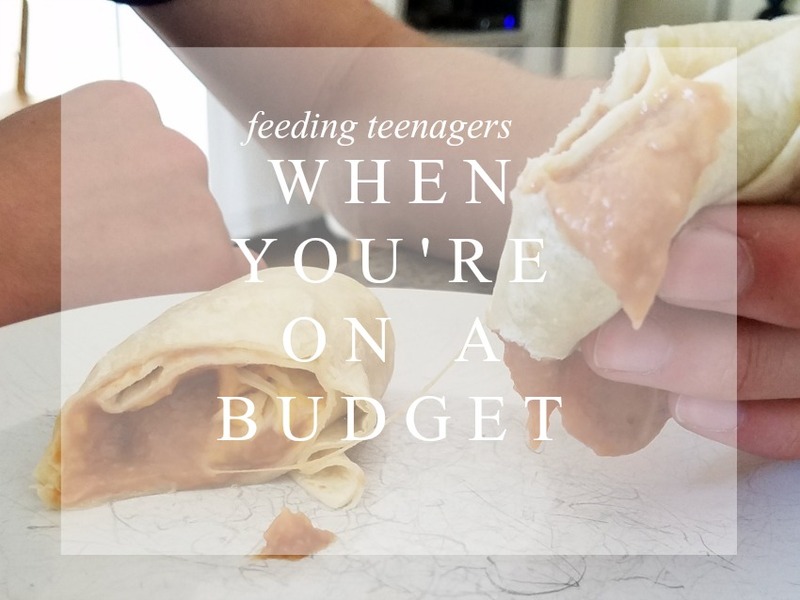 I would love to hear some of your inexpensive ideas for feeding multiple hungry, active teenagers (or crowds or family) and I'm sure I'm not alone... if you have some additional good ideas, please share them with us in comments so everyone can enjoy! Yes and Yes! I also like to keep salami, cheese, and crackers around. That's easy for them to just grab and go. My kids love burritos so I'm going to get what I need to make those asap. This couldn't have come at a better time! Our 3 growing grandsons are going to be staying with us for a week. They love to cook and these are all great recipes that will be easy enough for them to make and also something they'd like to eat. Thank you! Oh that's so great!! Enjoy your sweet time with them! And okay yes... truer words have never been spoken. Haha!!! My (now grown) daughters were happy with raw vegetables, fruits, and salads but probably because they had to be 'cuz I am not creative in the kitchen like you. Cute ideas! Brought back memories of my athletic brother eating entire loaves of bread after football practice. Lol. My Ava would have been fine without all this too- she's the easy one... it's the boys who eat non stop! Ha! Thank you so much. I enjoy reading your thoughts, insights and everyday going ons. 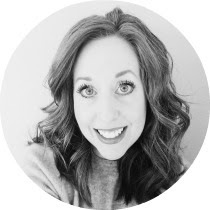 So good to have you back blogging! Much love! Aww thank you. I appreciate hearing that so much!! I make pepperoni rolls, which are always a big hit. Frozen bread dough, thaw and roll out - fill with cheese and pepperoni - bake. Easy, cheap and loved by my family. Also, roll ups - flour tortillas with lunch meat (any will do! ), and cheese, roll and you have an easy on the go snack! Also, a big pot of chili is always a winner - can be eaten as chili, served over chips to make nachos or over a baked potato - so much variety and always a winner! Great ideas... thank you for sharing!! Scrambled eggs w/ham and cheese on naan bread-from Costco. (can add whatever toppings you like, also freezes.) I also make pizza on the naan bread. We love energy balls around here! I place like 10 in baggies and keep in the freezer and get out what I need. They taste like cookie dough if you eat them frozen- yum! Let me know if you need a recipe! Great ideas here. You've inspired me to get my freezers stocked with easy snacks and meals for our active kids and for simple dinners on busy school nights starting in just a couple weeks. I make lots of bean burritos but use dried beans from Costco to make them super economical. Last school year I made some huge batches of PB&Js and froze them individually wrapped for quick additions to lunches for school (and because we have one allergic child, they weren't ever consumed at home and I made them on a day he wasn't here and was super careful with cleanup). This year I'll be making a cream cheese/jalepeno/cheddar spread and freezing sandwiches made with those in addition to the the PB&Js and pizza rolls.